This module is both a powerful documentation tool and an excellent defect detector. To detect defects however, the user must know what the dependencies should be. Additionally, changes in these dependencies following maintenance can highlight incorrect alterations. When used in conjunction with Dynamic Coverage Analysis, assertions are checked over an extremely wide set of paths. It can also be utilised as a system for producing diagnostics. Essential for DO-178B Level A certification, this extra coverage means that possible errors will be hit and there is a greater confidence level in the code when conditions are tested. Safe subsets for high integrity applications have been devised because the use of some standard features of a programming language can be dangerous e.g. dynamic memory allocation on a target that has fixed memory allocation could lead to the possibility of exhausting available memory. LDRA Testbed utilises a checking system to flag the use of outlawed language features. 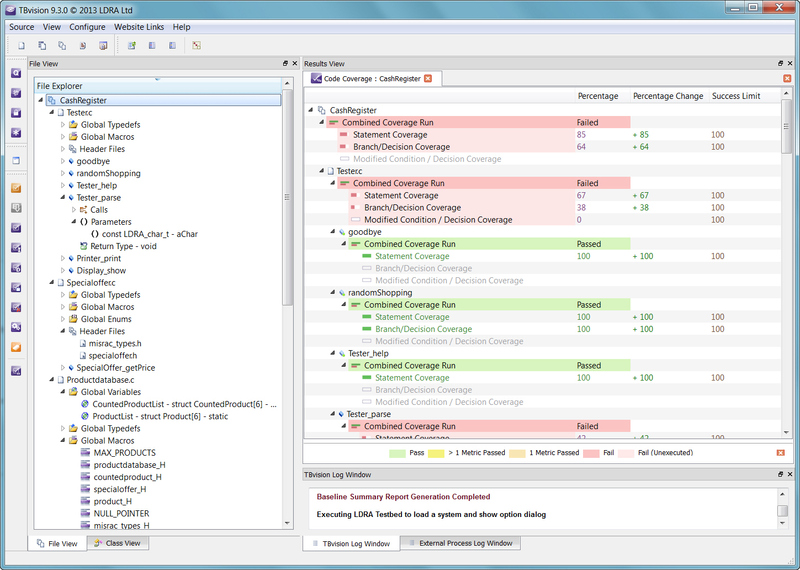 Dynamic Data Flow Coverage produces a cross reference list of variables, which documents where they are utilised within the source file(s) or system under test and their type. The module then maps coverage information onto each variable entry in the table for Current and Combined datasets.